Go to original pattern for design DROPS 105-37. DROPS crochet slippers in double thread “Alpaca”. For a more hard-wearing slipper use DROPS Fabel sock yarn. 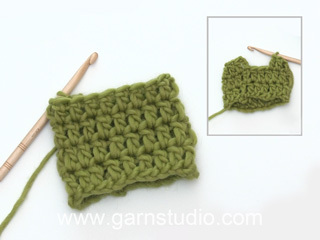 DROPS crochet hook size 3.5 mm - or size needed to obtain 18 tr x 8 rows with 2 threads Alpaca = 10 x 10 cm. 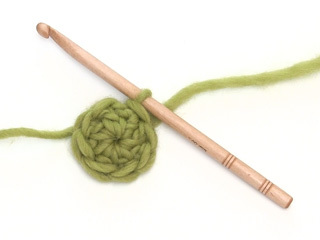 Crochet info: Replace first tr on round/row with 3 ch. Finish each round with 1 sl st in 3rd ch from beg of round. Finish each row with 1 sl st in ch from beg of previous row. Dec as follows at the end of row: Turn piece when number of tr to be dec remains and work return row. Increasing tip: Inc by working 2 tr in 1 tr. Foot: Crochet from toe towards the heel with crochet hook size 3.5 mm. 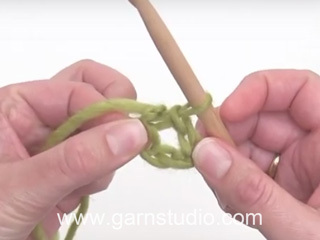 Crochet 3 ch and form a ring with 1 sl st in first ch. Round 1: 8 tr in ring – see Crochet info! Round 2: 2 tr in each tr = 16 tr. Round 4: * 1 tr in each of the first 2 tr, 2 tr in next tr*, repeat from *-* = 32 tr. Round 5, size 41/43 only: * 1 tr in each of the first 3 tr, 2 tr in next tr*, repeat from *-* = 40 tr. On next round inc 2-6-2 tr evenly = 34-38-42 tr. Continue in the round with 1 tr in each tr until piece measures 9-10-11 cm. 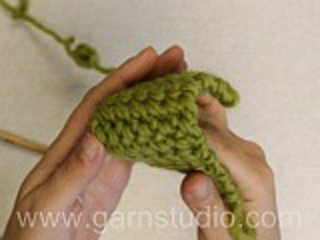 Now work 30-34-38 tr, turn the piece (do not crochet the last 4 sts = opening mid upper foot). Continue back and forth, at the same time dec 1 tr each side on first row – see Decreasing tip = 28-32-36 tr. Work 1 tr in each tr until piece measures 14-16-19 cm. Now inc 1 tr each side on every other row a total of 3 times – see Increasing tip = 34-38-42 tr. When piece measures 22-24-27 cm fold it double and crochet slipper tog mid back with a row of sl sts through both layers. Cut the thread and fasten. Border: Crochet a row of dc with 2 threads Alpaca and crochet hook size 3.5 mm round the opening (crochet approx 2 dc in each tr). Cut the thread. Change to 2 threads Cotton Viscose and continue as follows: 1 dc mid back in first dc, * 3 ch, 1 tr in the first ch, skip 1 dc, 1 dc in next dc*, repeat from *-* and finish with 1 sl st in first dc. Strap: Crochet 6 ch with crochet hook size 3.5 mm and 2 threads Alpaca. Work 1 tr in the 4th ch from hook (= 2 tr) and 1 tr in each of the last 2 ch = 4 tr. Work 1 tr in each tr – remember Crochet info – until strap measures 10 cm. Cut the thread and fasten. Sew strap to slipper with 1 pearl button each side – buttons are for decoration only. I do not understand what "inc 2-6-2 dc evenly" means. I know that the 2-6-2 is size, but what does "dc evenly" means. Round 4 ends with 32. I'm doing size 51/2. please explain how to crochet round 5 and the number of stich that I will end up with please. Thank you, Love the slippers. Dear Ethel, you've to work round 5 only if you're working size 41/43, otherwise, you've to work next round and increase at the same time: for example for size 35/37 you've ended up round 4 with 32 tr. On the next round you've to increase 2 tr (see increasing tip) and end up with 34 tr. Happy crocheting! Bonjour Céline, on monte 6 ml, on crochète 1 B dans la 3ème ml à partir du crochet (les 2 premières ml = 1ère B), on a ainsi 2 B, 1 B dans chacune des 2 ml (pas B, faute de frappe corrigée) suivantes = on a 4 B. Bon crochet! Hur gör man om man vill virka barnstorlekar, till exempelvis en 3-åring? Jo men vi har flera virkade tofflor till barn. Gör ett sök med "virka" och "tofflor". Lycka till! What does "inc 2-6-2 dc evenly" mean?? Dear Patrice, it means you will have to inc 2 sts in 1st size, 6 sts in 2nd size and 2 sts in last size evenly (crochet 2 sts in the same st evenly distributed on the row). Happy crocheting! I do not understand what "inc 2-6-2 dc evenly" means. Does it mean that one round you increase the 1 dc in the next 4 dc and then 2 in the next dc and then the next round is 1 dc in the next 11 dc and then 2 in the next dc? or is the 2-6-2 all in one round? Dear Mandie, this refers to the different sizes. Bonjour Souhila, vous avez crocheté 1 rang sur 30-34-38 B, puis vous tournez, et sur ce rang, vous diminuez 1 B de chaque côté. Bon crochet ! I Love these Slippers & have made 4 pairs and keep loving them!